Pumpkin butter is easy to make and makes a delicious change from butter for bread or muffins. 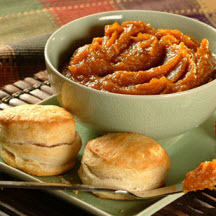 Serve pumpkin butter with biscuits, breads and corn muffins. Store in airtight container in refrigerator for up to 2 months. Recipe makes 2 cups; 32 (1 tablespoon) servings. Nutritional Information Per Serving (1/32 of recipe; 1 tablespoon): Calories: 30; Calories from Fat: 0; Total Fat: 0g; Saturated Fat: 0g; Cholesterol: 0mg; Sodium: 0mg; Carbohydrates: 8g; Dietary Fiber: 0g; Sugars: 7g; Protein: 0g.